Who doesn't remember a Fotomat in their past? Whenever I drive through the Lunds grocery store parking lot in the Highland Park neighborhood of St. Paul, I think of the little hut that used to be there. Back then, we had no idea that film and smelly developing companies and waiting for pictures would all be a thing of the past. And fans of "That '70s Show" remember that Tommy Chong's character worked at a Fotomat, although it wasn't allowed to use that brand name, apparently. Metafilter had a wonderful discussion of the long-gone Fotomats. I just love this photo, such a bright and sunny look at our more innocent days. And don't miss this slideshow. 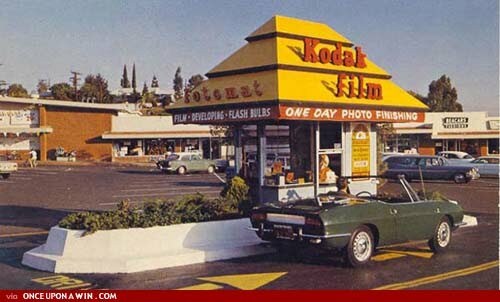 Looks like many of the Fotomats tried to make it as other ventures -- coffee shops, snowcone stands, etc. -- and many of those new businesses didn't make it, either. Tell us about your Fotomat memories, and what happened to the specific little shack that you knew best, in the comments.